Ask BB: Is the Longchamp Le Pliage Bag Hot or Not? While my school days are behind me, I happen to live in an East Coast college town, and lo and behold, the other day while driving through the center of the city, I spotted a stylish co-ed carrying a black Le Pliage large tote with tan leather trim and long handles. I nearly crashed in my attempt to get a better look at said handbag as the student slipped through a wrought-iron gate and disappeared onto the quads. Surprisingly, I was able to glean quite a bit from this brief encounter with the bag in question because the student had so over-stuffed her poor Le Pliage that it looked as though it was about to burst at the seams. This is not a good look whatsoever. The overburdened girl looked like her back was about to break, and god forbid she take a tumble on the snow and ice and wind up with the contents of her bag littered upon the ground for the whole world to see. Not cute. If you're running from your dorm room to one class with perhaps a notebook, and a few books, then I'd say this bag fits the bill. If however, you are one of those students who loads up your bag with a laptop and enough books to write a dissertation, then the Le Pliage should not be your first choice. But to answer your question, here's what I like and what I dislike about the Le Pliage bags as a casual observer, since I've never owned one of them (I remember when Eastpak bags were all the rage and I had to settle for a JanSport...). I'm sure my readers will be able to offer more useful opinions, too! Folds up to a nice compact size for travel/storage (although I doubt I'd be folding and storing anything that pricey). Build your very own le Pliage: If mummy and daddy are paying for it, go ahead and create a customized le Pliage to your own specifications. As you said in your question, they're everywhere. Like the original Kate Spade handbags or Coach logo totes, maybe this bag's past it's prime? I'm not sure, just throwing it out there. Where do you shop for stylish school bags on a budget? I bought my longchamp le pilage bag at a thrift shop for 90 cents! I use it when I travel. 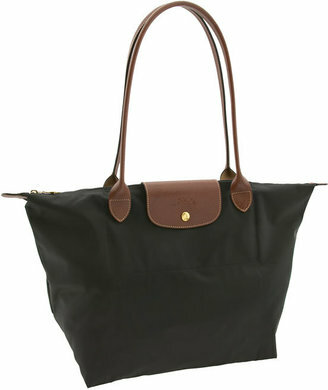 I LOVE my Longchamp tote! I've used it for a good 3 years, carrying all my books to school every single day- it's finally starting to show a bit wear and tear but I love it. I'm using a limited edition pink, so I'm the only one at my school who has that color. Pretty much everyone else uses black or navy. I hate those bags! At my school, it's part of the required leggings+Uggs+messy bun+oversize sunglasses uniform that all the sorority girls sport every day. They're not original, or even cute. Personally, I think a lesportsac large shopper tote is just as useful, will have a fun, unique print that brightens up your day, and is at least 1/3 of the price. That's what I used in school, at least! has anyone seen the forever 21 faux leather drea in person? i'm looking for an inexpensive lightweight (key feature) bag in that style. These bags have been hot in my coutry for many years now. I own several of them and they are very handy indeed. I like the larger one with the large handles best (like the one shown in your picture), but also love my two-coloured one with zippers to make it smaller or bigger. They are getting a wee bit old around here, but with a classic outfit they still are a classic style handbag. Check out the website as well, you can order them with custom made colours and zippers and your initials embroided. I'm going to have to go with Kelly on this one - this sort of trend (and the complete lack of personal style and creativity it invokes) drives me insane. But I LOVE some of the alternatives you recommend. The world needs less "It" bags and more "Me" bags. $145! You gotta be kidding me! Cracking up at comment 3, Kelly. I know exactly what you are talking about. Anyway, yeah I'm not a fan. At all actually. Whatever happened to just a cute inexpensive tote, or even a bookbag? I love style just as much as the next girl, but $145 on a college campus? Come on now. Every now and then K-mart carries a knock-off of this style in various colors. Keep an eye out for them. Thanks for sharing, after reading everyone's comments I'm beginning to think Longchamp bags are not like the ubiquitous Coach logo bags at all. Maybe if you're on a college campus where these Le Pliage bags are popular, you should find an alternative, but in other settings I think this is just a good looking classic bag. Hope that makes sense. Great post! I have been debating buying another Le Pliage for a while now though I love the style of the bags! Yes - they are too expensive for the quality of the bag - but the price is what makes them sort of exclusive! My #1 problem with the Le Pliage is that if you're using it for school books, the books end up flopping and sliding around in your bag because the bag has NO structure! That's a big negative for me. The next problem is that there is ONE SMALL INTERIOR COMPARTMENT - AND it's not close-able! That bugs me to death. But the bag comes in lots of colors (a plus) and yes, it has a classic style. The best part of the bag is the rich brown leather trim. And Kelly, all the trendy girls on my campus carry Longchamp bags also! (lol!) And just like the girls on your campus, they all wear leggings and Uggs. Some of them have messy buns but most of them wear their hair down. And for them, the oversized sunglasses trim is over. But I know exactly what you mean - it's a major trend over here also! I am not a fan of the le pliage even though I like preppy style. Those bags look lumpy when you put things in them and are not cute. I like the le pliage cause it's lightweight yet very roomy. It is rather hard to use without a bag organizer though. Recently found the perfect bag organizer for the le pliage -- a Bag-2-Go organizer! It's the best I have found so far.. Very very satisfied. So now, I love my le pliage even more! I have three longchamp le pliage and I love it! I got chocolate, light pink and navy blue. Short handle and long handle are both okay. It's very useful and practical for me. I can use it everyday and when I travel. I could also use it as a diaper bag I love that it is water resistant. I'm a mother of a 2-year old son. It doesn't rub onto my winter coat (winter white) and smudge its color. when it rains outside, i don't have to worry about anything inside getting soaked or even the bag itself! i have the red, and it's absolutely beautiful. i get compliments all the time, even from other le pliage owners. i've used it as a carry-on, diaper bag, laptop bag, gym clothes bag, etc. I don't fill it to the brim as i did ONCE and a little hole formed on the bottom corners. i've even spilled my son's juice one day in the bag. i cleaned it up and everything still looks brand new inside. what other bag can you say that about? it's the perfect travel and everyday tote! honestly $145 is inexpensive for what it can do. it's a classic look. the only con is that almost every woman in my neighborhood in DC owns it.